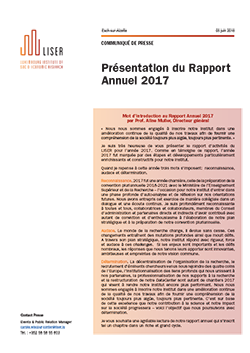 The presentation of LISER’s 2017 Annual Report took place on June 5th at the ‘Halle des poches à fonte’ in Belval. Prof. Aline Muller, CEO, gave the keynote speech, where she highlighted the excellent results attained by the Institute, particularly in terms of publications of scientific articles in peer-reviewed journals, as well as partnerships and projects carried out and developed by LISER researchers. This year LISER collaborated with students from professor J. Tomassini’s class at the school ‘Lycée des Arts et Métiers’ (Limpertsberg) on a pedagogical project. In this context, students were asked to take pictures across the country to try to capture LISER research themes through the lens of their camera. A selection of these photos were the subject of a mini exhibition during the unveiling of the Annual Report event. Following the CEO’s introductory words, there were presentations by the Directors of the three scientific departments, the Data Center Manager, and the Project Management Office Manager who represented the research support teams. To conclude the event, the closing remarks were given by Mrs Nicole Kerschen, President of the LISER Board of Directors.